Kanye and Drake's collaborative project has been a vague possibility since February 2015, when Ye told The Breakfast Club that him and Drake were talking about doing an album called Wolves. 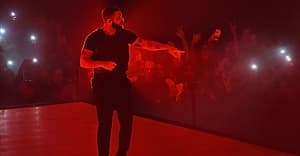 However, the existence of the project grew more likely when Drake brought out Kanye during the second night of OVO Fest 2016 and the two teased the album together on stage. Today, pictures of a green billboard in L.A. surfaced on the internet, further hinting at the project. The announcement reads, “Calabasas is the new Abu Dhabi,” with the OVO and G.O.O.D. Music logos beneath. However, Twitter users were less than excited for the announcement, predicting that the project would be "weak" and "passive aggressive." View the reactions below. Catch up on the brief history of Kanye and Drake's collaborative project.